Essential oils + aromatherapy for rosacea & sensitive skin. Toronto’s first medical spa to launch EveTaylor® of England. Why do we recommend Eve Taylor? Eve Taylor has been producing skincare for over 50 years. Working in small batches, all products are produced in small batches to ensure our clients are using ingredients that retain their freshness and potency. 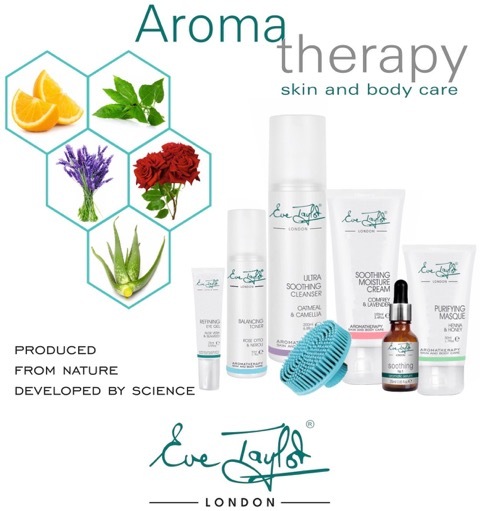 Eve Taylor essential oils are gathered by hand and put through an extraction process within hours of the harvest. These strict regulations maximum potency & therapeutic effect with the best possible results for your skin. Aromatherapy is the practical use of essential oils that are carefully extracted from the portions of plants that have proven therapeutic properties.Apart from smelling pleasant and giving sensory gratification, essential oils also have the ability to calm and nurture sensitive skin. Essential oils have a multitude of therapeutic properties. When blended with other essentials the synergy is is exponentially more effective. Camellia Oil calms skin and is a pH stabilizer. Organic colloidal silver to reduce redness. Vitamins and minerals for topical skin nutrition. How can Eve Taylor® facial oils help my rosacea & sensitive skin? Essential oils re-hydrate, restore, and re-balance the skin. Calms and soothes chronic redness and inflammation. Aids in absorption of all other products used. EveTaylor oils are pH correctors – everyone can benefit! They help to connect the mind, body and spirit. Provide aromatic benefits while aiding in treating rosacea and sensitive skin! Offers a more natural approach to skin care while being highly effective. FACT: Essential oils are the only scientifically proven delivery system into the body. Essential oils are distilled via heat, steam and water. This process eliminates the compounds that trigger allergies because these compounds simply cannot pass through the distillation process. Therefore, sensitivities to essential oils, in the sense of allergic reactions, are not possible. Allergic sensitivities are due to the body developing antibodies in response to certain nitrogenous molecules. No one has ever found antibodies in humans from essential oils. So if one has a reaction to an essential oil, it is something else. Not an allergy. For people with nut allergies, celiac, gluten free, etc…..the offending protein in all carrier oils has been removed. Topically, one should not have a reaction to these.